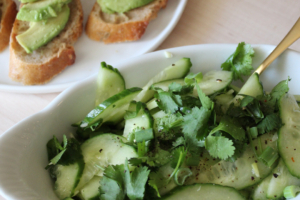 Enjoy this fresh and festive cucumber lime salad as a delicious alternative to your usual Friday happy hour chips and dip routine. Cucumber is a great choice for athletes as it is hydrating, anti-inflammatory and a good source of potassium (an important electrolyte in the body). The lime gives it a bright freshness, and the garlic more anti-inflammatory benefits. Pair it with some avocado for a little extra healthy fat, fiber, and overall yumminess. If you really still want chips and dip, chop the cucumber into small chunks and eat as salsa! Whisk together the olive oil, garlic, lime juice and red pepper flake. 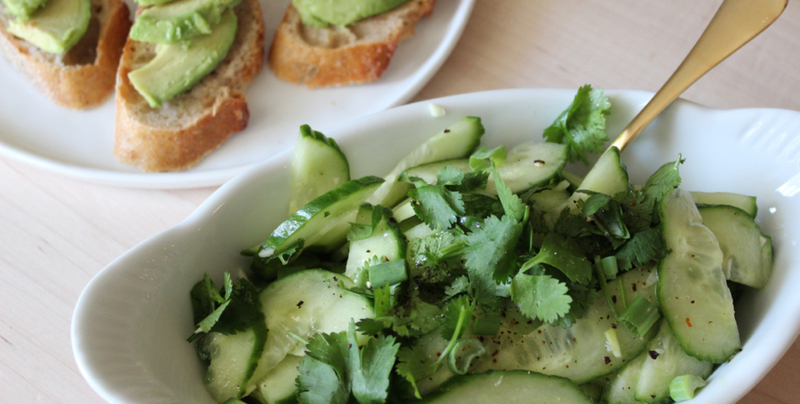 Combine dressing with sliced cucumbers and cilantro. Garnish with avocado if desired.